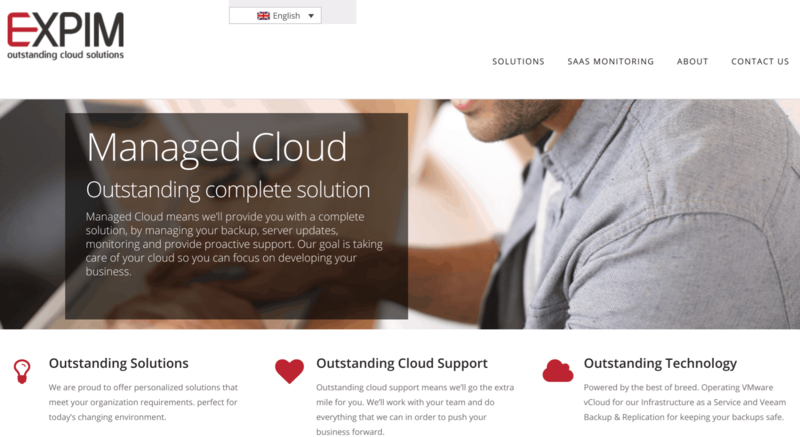 Expim Review 2019: Is Expim a Good Hosting? Founded in 2005, Israeli cloud solutions provider Expim’s managed hosting plans come with a free CDN, choice of 13 data center locations, and a 99.99% uptime SLA. It’s just a pity I couldn’t get answers from this company’s customer services. Expim has been providing managed cloud services since 2005. Based in Israel, it has a modern website and several relatively active social media profiles. The Expim website is presented in English and Hebrew. All of Expim’s plans are fully managed, so you don’t have to handle day-to-day hosting tasks such as server configuration and maintenance, cloud security, or backups. You also get a variety of performance-enhancing features for optimizing page load speed and smoothing hosting scalability. All plans come with a free CDN and website acceleration so that your website loads quickly from every location around the world. For customers with a client base in China, Expim provides a China Hosting managed solution specifically for you. And this company will also manage your AWS cloud services, including infrastructure management, monitoring, support, cyber security, and even consulting. Expim’s website boasts about 13 worldwide data centers (so you can choose a location close to your audience) but wasn’t forthcoming about where those data centers actually are. This vendor also boasts about a “Four 9s SLA,” which isn’t really substantiated but which should mean to can expect 99.99% uptime. Like most managed cloud hosting providers, Expim does not advertise its prices on its website and does not let you purchase plans online. This is quite common due to the bespoke customized nature of such cloud solutions. What I can tell you is that you only pay for the resources you use. You can scale your resources up or down by adding virtual servers or bare metal servers, and you can increase your RAM and/or data storage without changing your server’s base configurations. I tried contacting this company to get additional information about the pricing and contract terms, but I received no reply after waiting two business days. Maybe you’ll have more luck when you try to engage by telephone, email, or by filling out their contact form. Expim offers fully managed cloud services using its technology partners Zenedge, VMware, Veeam, cPanel, and Incapsula. The customer service appears to be limited and (in my experience) unresponsive, but the solutions seem to be solid and suitable for businesses looking to outsource the management of their hosting services to a global company with 13 data centers and a 99.99% uptime SLA. Wondering how Expim stacks up against other Web Hosting companies? Enter any other Web Hosting company and we will give you a side-by-side comparison.